This is part #1 of a budgeting series, for part #2 please read – how to stick to a budget. I was owed £700 from Amazon so I naturally I went about spending my £20 as soon as possible. I naively thought the £700 would arrive in a matter of days, enough to more than cover my first month home and maybe even a deposit to rent my own place…how little I knew. Fast forward three and a half months of catching up with friends and family and picking up my first ‘proper job’ the cheque was finally cashed into my account paying off my bundling overdraft and bringing me back to a balance of zero. So what had happened that despite having a full-time job and living at home a £700 cheque only got me back to zero? Whilst waiting for the £700 I’d got into a bad habit of spending more on my credit card as each month passed. This meant more and more of each month’s pay cheque was being used to pay off the previous month’s credit card bill leaving me more and more squeezed every month as the cycle continued. Which I resolved by…spending more on my credit card. Value your time? 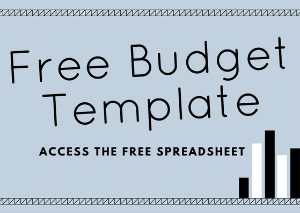 Download this guide (and my free budget template) as a simple one-page checklist – here. Thankfully, I choose the second option, unfolding a chain of events carrying me into financial security. In the last decade consumer debt has been creeping up on us, in 2016 The Money Charity reported the total outstanding consumer debt (in the UK) totalled £184.3 billion or £6,825 per household, of which £2,397 comes from credit cards. If you took the UK’s total credit card debt alone, it would take 25 years and 6 months to pay off (based on the minimum payments). Whilst in parallel 46% of households have less than £1,500 in savings (The Money Charity). For this reason if you’re looking to budget ensure you follow Money Nest’s Budgeting Rules. With more and more of us squeezed financially, payday lenders springing up left, right and centre, credit cards on the rise and even banks pushing us to take out loans – you only have to be broke for a few days before consumer credit starts to look very tasty. Payday lenders and credit cards offer the benefit of fast cash without the embarrassment. No need to ask family or friends and no need to ‘cut back’ and don’t get me wrong if you’ve got a firm grip on your finances the incentives offered by credit card companies are fantastic. These benefits however have literally been designed to ‘get you in the door’, once you’ve ‘broken the seal’ the chances are you’ll return for more and more. Combine this with an unexpected bill (such as a car repair, insurance or expense) and you’ll find yourself slowly being pushed up against a wall by consumer credits overbearing father – Mr Bankruptcy. What’s more using a payday lender can raise a flag on your credit file that can be justified to refuse mortgage applications (even if you paid them back on time), they don’t advertise that one do they!? Payday lenders have been proven so bad even the government intervened cutting rates (back in 2014 one popular lender was offering 5,853%, no that’s not a typo – borrow £250 and a year later you’d owe £14,632.5!) yet rates around 1,500% are still typical. This is literally insane. When I was 17 everyone drove an absolute banger but as I’ve gone from 17 to 27 these have slowly been replaced by high spec executive cars. If cars are your passion or your priority isn’t saving, I see nothing wrong with this. But as the cost of your car increases so does the cost to insure, replace parts, change tyres and sell (through an increase in depreciation). Despite financing costs being competitive, if you purchase a car on finance generally you’ll purchase a car much more expensive than if you’d bought with cash. The initial rush of your new car will feel great but by the time your fourth or fifth car payment hits your bank account (often £400+ a month), the realisation that you’re not going to be able to save a penny for the next two years will kick in, all whilst the car is depreciating in value. Oh, and please hope you’re not squeezed financially and forced to sell your car, only to realise the remaining loan is more than the saleable value (of the car)…oh yes a triple slap across the chops. Upgrade to this year’s latest iPhone and you could find yourself paying up to £69.99 a month, plus a £99.99 upfront cost = (£1779.75 per year). Compare this to a comparable sim only deal – pay £16-£36 a month (£16 = 4 gig data and 600 minutes) include a generous £500 for a new phone and over a 24 month period save up to £1,279.75. I’ve been informed this woman is using the latest iPhone, or if you’re reading this on a Monday it’s probably several editions behind. Purchase a cheaper phone (you really don’t need the latest iPhone) or second hand (you can purchase refurbished phones direct from Apple, or cheaper via eBay) and you’ll save considerably more. Whilst it’s exciting to be offered a free upgrade consider you’re signing away £1,279.75 (see above) and you may find the slow motion camera looses its allure! As your income grows so do your expectations of normal, the budget gym you attended becomes the health club, the high street suit becomes the tailor made edition. Often expenses grow so quick they out-strip your new higher income, perpeutally placing you in the ‘rat-race’. Watch this like a hawk if you intend on saving more. Understanding these rules and applying as many as you can allows you to maximise your savings. If you’re struggling financially budgeting will do little to help if you continue to live on consumer credit, finance your car and drop large amounts on your phone contract. I’ve created a free budget template for Money Nest readers, complete with all the common expense and income categories. Save your time and download for free – here. The spreadsheet is split into sections (such as household bills, car etc), fill in each section to see your total monthly spend. Towards the end of the spreadsheet enter your monthly income. You should strive to increase your savings percentage each month. Popular US personal finance blogger Mr Money Mustache demonstrates if you’re able to save 50% of your income (assuming an investment return of 5% and 4% withdrawal) you can retire in just 17 years. For someone who’s now 27, that means retiring at 44 years old. Or ramp it up to 80% and retire in five and a half years time. This is powerful knowledge if you put it to use. Now add in how much you are saving/investing each month. It may come as a surprise that you need to cut back your savings or expenses. This is largely due to the spreadsheet including yearly costs most would leave out (such as Car Tax/Insurance). You’ll now want to play with your budget into you get the figures to match your saving goals. Still reading, but not yet calculated your budget? You’re probably thinking, there is a whole bunch of friction involved in opening a spreadsheet and running the numbers (honestly it’s really simple and quick) and it can be tempting to not want to work out your budget as reading makes you feel like progression. Yet without taking the time to sit down and work your finances out this knowledge is useless. So if you’ve not done so, calculate your budget now. Work out your budget and get total clarity on your finances. In part two of this blog post we’ll cover the difficult bit – how to stick to a budget (using technology and old-school methods). Earning lots of money but not knowing how to manage it is a bit like eating soup with a fork – you’ll keep busy but you stay hungry. You must educate yourself and running a budget is one of the essential pillars. Don’t let your money slip through your fingers too. Living in surplus is the only way to true freedom. Value your time? Download this guide as a simple one-page checklist and I’ll even throw in my free budget template! Click – Gimmie them all! Great post Sam, very handy facts to know. I’m following all the budgeting rules you mention, and I’ve got a budget, but I still struggle to stick to it, so I’m really looking forward to part two of the post! Thanks Evelina, much appreciated! Have got some great ideas lined up for part #2. I always enjoy reading your blog! Keep up the amazing work guys, I’ve incorporated you guys into my blogroll. Great blog entry – I recently started a budget and so far so good! Great to hear. The hardest step is getting started!